. :: SAEED'S BIG MOVE UP FOR RECORD 8TH WORLD CUP ::. Godolphin trainer Saeed bin Suroor knows well the pressures of G1 Dubai World Cup night but he stands proud of his record on the richest raceday on the planet. 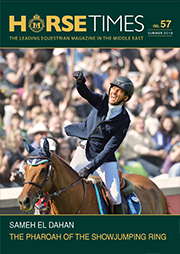 Saeed has won seven Dubai World Cups, which surpasses the feats of a collection of the biggest names in the ranks of international trainers - and the relevance of that achievement for an Emirati is not lost on him. "It's great for a local person to win it," Saeed told me. "The best trainers in the world, the best owners, best jockeys, all come to Dubai for this meeting, and to win the World Cup is something very special for us," he pointed out. But hand-in-hand with an impressive track record; comes the burden of expectation. "There was pressure from the local fans. They were expecting us to win it every year. But these days they understand how tough the race is. Sometimes you have luck, sometimes not. "We always produce the best we have for the World Cup, and this year, we have a horse, who has a chance - Move Up. He worked four days ago, and he worked really well. I am happy with him. "He won a G3 at Ascot earlier in the year, and he also won a G2 in Turkey. We brought him to Dubai, he needed the race last time (at Meydan) but he showed he has improved for the race. "Of course, the quality of the horses running in the World Cup is completely different. The best quality horses are coming here for the race, and Arrogate, naturally, is the one everybody sees as the one to beat. "But our horse has a big heart, he always tries, and I think he will do well, given a clear run," he added. Saeed's best chance for the night is Thunder Snow in the UAE Derby, another feature race he has won seven times. "I think we have chances in every single race. But Thunder Snow is the best one, provided he stays the trip. He won a G1 in France at the end of last year, and then won the G3 UAE 2,000 Guineas on dirt at Meydan. "Beautiful Romance in the Dubai Gold Cup also has a chance. She won a G2 in Melbourne off the back of an excellent run in the G1 Melbourne Cup," he added. All talk of Dubai World Cup night with Saeed inevitably leads to mention of the great Dubai Millennium, who annihilated his rivals in a record-breaking World Cup triumph in 2000. "He was a superstar," his trainer recalled. "He was so brilliant," he added with a wide smile. Saeed will be hoping the next equine superstar is not far away.